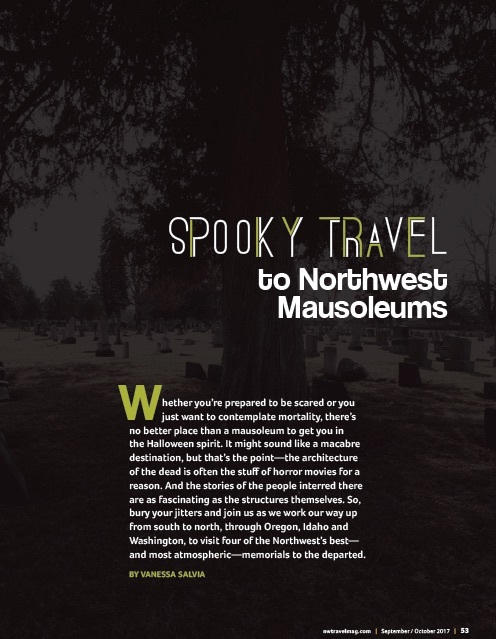 For the Fall 2017 issue of Northwest Travel and Life magazine, I got to cover four of the West’s best mausoleums and memorials for a spooky travel feature. 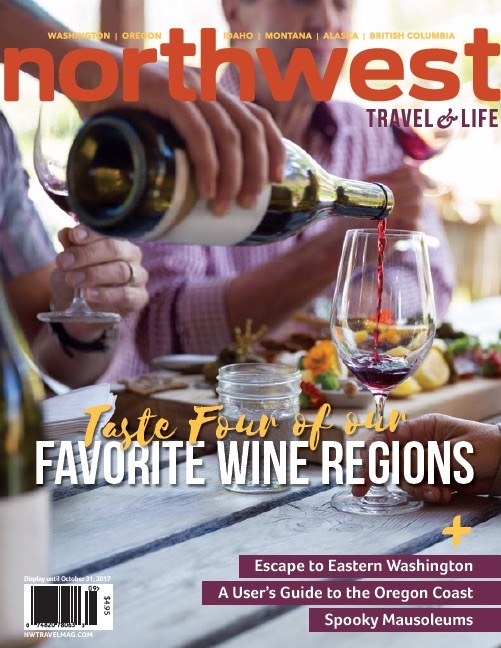 Read this article as it appears on the website of Northwest Travel and Life magazine. Nice that it’s teased on the cover. Click here to view the full PDF of Spooky Travel. 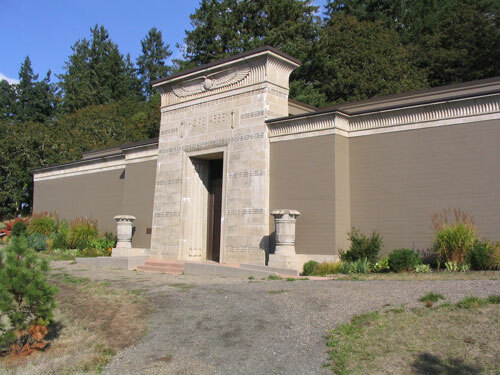 Nestled at the western edge of the Eugene Masonic Cemetery, the Hope Abbey Mausoleum features traditional Egyptian funerary symbols, such as papyrus bundles, lotus-blossom urns and a solar disc with snakes and outstretched wings on each side above its magnificent entrance. The walls are Tokeen marble, quarried off the Alaskan coast. Sunlight shines through golden stained-glass windows clad in copper, casting a warm glow upon metal lotus blossom details and what Hellesvig presumes is a papyrus bulb on the window frames, both symbols of early Egyptian dynasties. Ten-foot-tall bronze doors admit the public to attend occasional musical events, and visitors are admitted for tours on the last Sunday of each month, except December. The cemetery surrounding the mausoleum holds most of Eugene’s historical names, including city founder Eugene Skinner. At the 1914 dedication of this nearly 2,000-square-foot mausoleum, optimistic Masons included a time capsule to be opened in 2914.